Please forgive me. I had so much fun making Yandere Clicker that I decided to update it. Now you can buy upgrades to stab Senpai even more. This entry was tagged Yandere. Bookmark the permalink. After getting an upgrade to the price of 2147483648, it locks on -2147483648 and every upgrade gives you the amount instead of taking it. Can confirm this. Senpai can now feel the deredere of 203691718 stabs per second. Oh, snap. I know why that’s happening. I was actually aware that this bug had the potential to happen, but I decided not to address it, because I didn’t think anyone would even care enough to buy that many upgrades. I am pleasantly surprised to learn that somebody enjoyed the game enough to play long enough to encounter this bug! I can fix that bug; it would only a take a couple of minutes. 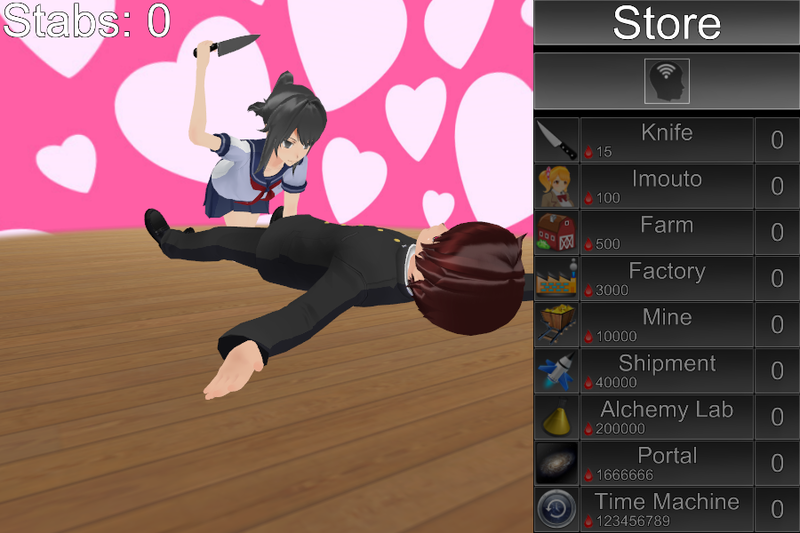 I probably won’t add any new features or bug-fixes to Yandere Clicker for a long time, other than this one fix. Oh man. This is the beginning of the end. Time Maschine is underpowered, Dev.